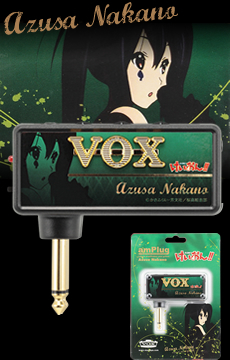 The Vox Amplug is a tiny amp modeler that plugs right into your guitar. Perfect for practicing without waking the baby/wife/girlfriend/etc. And if you’ve got a decent pair of headphones, it sounds pretty darn good for something so light and made of plastic. The Amplug comes in a bunch of different versions for different types of sounds: AC30, Classic Rock, Metal, Night Train, Twin, Lead, Bass, Acoustic and even Joe Satriani. Prices range from $40 – $50. The AC30 is supposed to sound like a Vox AC30. 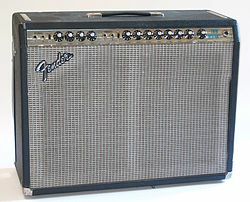 The Twin is supposed to sound like a Fender Twin Reverb, and the Night Train like a Vox Night Train. Well, do they? I’ve got the AC30 and it sounds good enough through my earphones, but I think expectations should be tempered. The amplug has tone, gain and volume knobs, an on/off switch and a small red led that let’s you know it’s on. That’s it. It’s made of plastic and the knobs and on/off switch are of the sort you’d find on a cheap radio. Two AAA batteries provide the power for around 7 – 8 hours of stealth jamming. It is light and made of plastic, but mine has worked without any problems for a little over a year. I’ve dropped it on my hardwood floor several times with no ill affects. The amplug will fit into just about any electric. I was concerned it wouldn’t work in a Strat body, but it plugs in just fine. I’ve been using mine with my Yamaha (Les Paul style) and it sort of juts out from the bottom a bit–I’ve smacked it on my desk a few times while it was connected and it held up ok.
There’s also a stereo aux in jack if you want to use a jam track while you are practicing which is nice. Sometimes I’ll plug into the aux jack while watching a lesson video or jam track on YouTube. Nope. The amplug don’t sound like this. The amplug is great because it fits in your pocket. It’s truly great on the go. If your guitar is going with you somewhere and you don’t have space for your Marshall JCM900 in the trunk of the Civic, then the amplug is it. Though some prefer going with a tiny practice amp like a Roland Micro Cube with built-in effects. These aren’t that much more expensive and they are much more versatile. And these would fit in the Civic. And you can play through the speaker or into your headphones. You know you want this. Admit it. For you hard-core amplug enthusiasts. (Shame on you!) Straight from Japan comes the Azusa Nakano signature model. Step aside Satriani. This is an only in Japan item, I believe, and is based on the Night Train model. Also from Japan is the Mio Akiyama model which is based on the bass amplug. If your expectations of perfect sound don’t get in the way and you’d like to have an amp in your pocket, the amplug is great. I love mine and use it all the time. Sure, my little Vox practice amp sounds better, but the amplug delivers a good enough sound to make practicing on the go enjoyable. Please leave a comment below with your thoughts on the amplug! Hi! I've got a Yamaha "les paul style" too, and I'm considering buying one of these... maybe ac30, twin or classic rock... but I'm wondering how they'll work together... Do you have any demo? Thanks! Cool, you've got a Yamaha "LP". The MIJ ones from the 70's and 80's are sweet. You can't go wrong with the ac30. I've got one and used it a bunch. I don't know about the other two. Lately I've been playing through my iPod using the JamUp app and the $20 adapter by Positive Grid. I'll be writing up a post about that one soon. Thanks for your comment.